Real Name: Millicent Smith - also known as Millicent "Dolly May"
Millie's singing career began at around the time she entered her teens. She rapidly became a popular artist in the West Indies and was one of the few female performers to be involved in the branch of R&B music that grew in those islands- 'Ska'. In fact her early local successes were made as half of a duet called 'Roy And Millie'- the other half was Roy Panton. She also recorded as half of 'Owen & Millie' (Owen Gray) and 'Jackie & Millie' (Jackie Edwards). These record releases were on labels like 'Studio One', 'Island' and the legendary 'Blue Beat'. In fact she was to become known in the West Indies as the 'Blue Beat Girl' and 'Ska' is still known by many people as 'blue beat'. There were so many parallel releases on these labels in the West Indies and the UK that it is difficult to unravel a true UK discography for many West Indian artists, Millie is no exception. Despite Millie's success on Fontana, the company issued only the record shown here on the Extended Play format. This is now quite hard to find, but there are two more even rarer EP issues in existence. One was issued later on the Island label and another- rarer still- a collection of material that she recorded for Blue Beat before her chart career, but I have never seen a picture sleeve for that release. Millie Small was brought to Britain during 1963 by Chris Blackwell, who later did much to promote Reggae in the UK. Her first UK release 'Don't You Know' owed rather less to her Ska background, being accompanied by an orchestra conducted by Lord Rockingham's Harry Robinson. It didn't sell too badly but Millie's unique high pitched style wasn't enough to get it into the chart. However, her second release was a stronger song and was based more closely to the West Indian rhythms she was accustomed to. It became a massive hit on both sides of the Atlantic reaching #2 in the U.S. chart as well as in Britain. Sadly, despite the great success of the record, it did not set a new musical style in people's awareness. 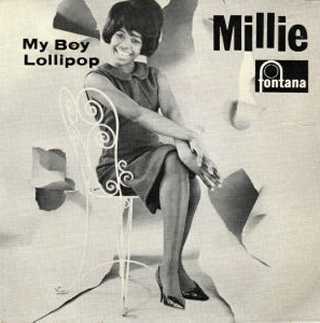 'My Boy Lollipop' was simply regarded by most record buyers at the time as an item of delightful, but lightweight, 'pop' . (Incidentally the record is alleged by some to have a young 'Rod Stewart' on harmonica). Although she had a couple of further minor hits, she never managed to consolidate her famous smash. She remained in the public conscience for a long time and was also regarded by many as a role model; something with which the charming lady was never entirely comfortable. Ska became popular on both sides of the Atlantic, reaching its peak in the UK during the late 1960s. Its popularity was more enduring in the UK than in the US, probably because of West Indian emigrees that went to Britain taking their musical enthusiasm with them. Ska gradually evolved into reggae, but was revived during the 1970s and 1980s by UK groups like the 'Specials'. Millie's issues after TF617 were credited to 'Millie Small' as were most of her US and West Indian releases.